There is a saying in these parts, that twenty Latin American countries were born in Trujillo. The reference is to the hundreds of Conquistadors who came from the town and surrounding villages, and travelled to the Americas seeking their fortune. Or at least better fortune than backward and poverty stricken 16th Century Extremadura could offer them. Men like Francisco Pizarro who conquered the Inca Empire in Peru, Francisco de las Casas who rode alongside Hernán Cortés when he conquered Mexico, and Nuño de Chaves who founded Santa Cruz de la Sierra in Bolivia, all stamped their mark on the Americas. The vast wealth they accumulated as they rampaged through ancient civilisations from Argentina to Mexico has stamped its mark on Trujillo. The old town, safely inside the city walls, is filled with beautiful 16th and 17th Century mansions, all constructed with looted silver and gold; their ill-gotten gains built and endowed numerous sumptuous churches; and the narrow medieval streets hold a powerful fascination, every turn bringing you into contact with reminders of the extraordinary historical events in which Trujillo had a central role. We arrived in the late afternoon under a blue sky and hot sun. After checking into our hotel, housed in the former 16th Century Santa Clara monastery, we headed to the Plaza Mayor to take the pulse of the town. The plaza is a beautiful place, the wonderful atmosphere only undone by the number of cars passing through it. After a quick visit to the cathedral, we plonked ourselves down at one of the cafes and did some people watching while relaxing with local tapas and Extremadura wine. Fully refreshed we hit the streets. It was mid-week and the town was pretty quiet, walking the steep and winding lanes is incredibly atmospheric, history seems to seep out of the walls. This is good because you’ll get a closer view of the walls than expected as you fling yourself against them, or into a stranger’s doorway, to avoid being run over by speeding locals who drive up and down the narrow streets with abandon. Cars are a blight on Trujillo, nowhere seems to be pedestrian friendly. We found ourselves at the top of the town outside the imposing walls of the castle. Originally Moorish, it was captured in 1232 by the Reconquista, and expanded under Christian rule. Presumably benefitting from Inca and Maya gold. From up here, and under a low Spring sun, the town looks spectacular. Winding our way back through the town we passed more extraordinary medieval mansions, taking in a couple of churches as we went, and explored wonderful streets that feel like walking through history – at least when you’re not dodging cars. Given the history of some of the buildings, it’s bizarre to discover many seemed abandoned and in a state of neglect verging on disrepair. This included the Palacio de Conquista, the grand house on a corner of the main square built by Hernando Pizarro, the only one of the four brothers to die in Spain. The town isn’t big and we soon found ourselves back in the Plaza Mayor. It was definitely time to sample a few local dishes – this region is famed for good food – and to expand our knowledge of Exremadura wines. I’d read somewhere that the wine of this region was gaining a reputation internationally, in a good way, so it seemed like a wise investment to get ahead of the curve. The night air was still a bit chilly, and on a Tuesday night the town quiet, but this is Spain and we found our way to a busy restaurant for a fun evening sampling the local produce. 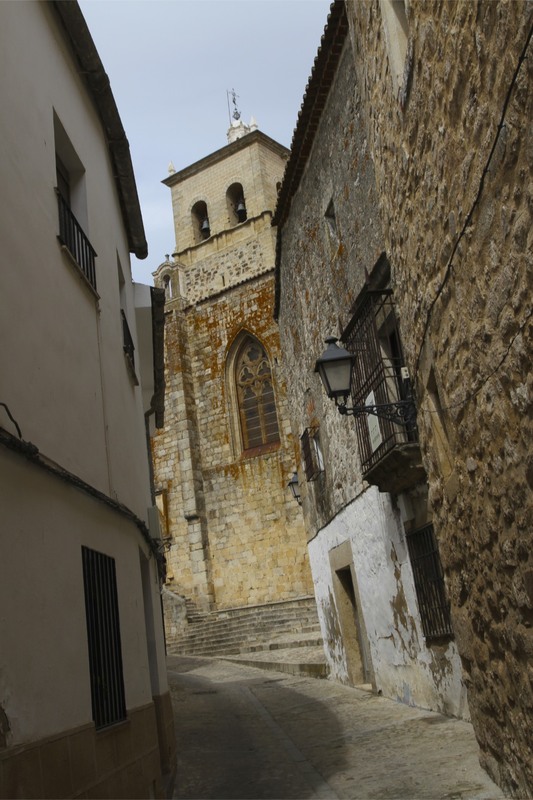 Trujillo is an incredible place with an extraordinary history. 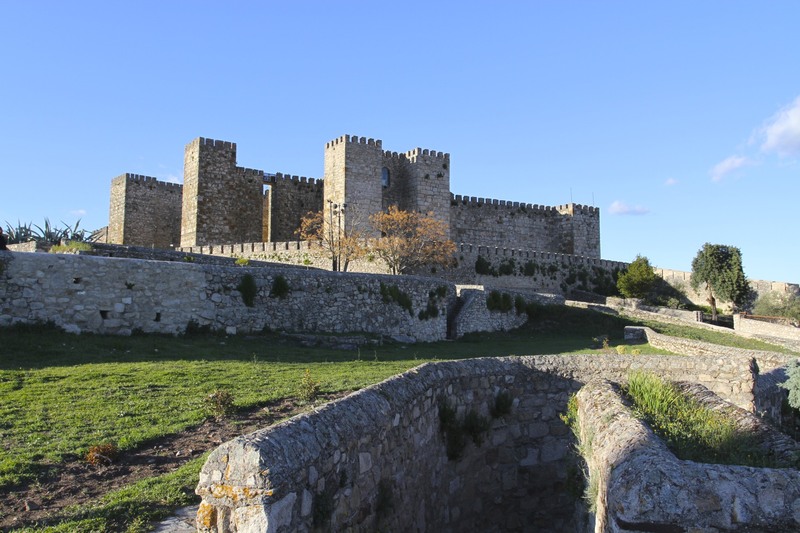 This town in the centre of Extremadura played a far more significant role in world history than its size indicates. It’s grand historic buildings seem inappropriate for a town of this size; and even the glorious medieval mansions, vast castle and elaborate churches don’t really do justice to the influence Trujillo had on the history of the medieval western world. A visitor from another planet would have difficulty working out why such grandeur exists in such an unlikely place. Walk around the beautiful (although plagued by cars) Plaza de Santa Maria, and you’ll come to a building that begins to explain what happened in Trujillo. On a corner of the square stands the Palacio de la Conquista; if the name isn’t enough the building is decorated with sculptures of former leaders of the Inca Empire, in chains. This is the house Hernando Pizarro built. Hernando was one of the famed Pizarro brothers, Conquistadors who travelled to the New World in search of vast wealth. The Conquistadors were little more than mercenaries, and the Pizarro brothers exemplified the violent world into which they were born. Led by the illiterate Francisco, all four brothers played a major role in the conquest of Peru and the brutally efficient destruction of the Inca Empire. The vast wealth they stole or extorted from Inca nobility went to build Trujillo’s beautiful and well fortified medieval mansions. It is hard to imagine that a powerful and sophisticated civilisation, numbering millions of people, could be destroyed by a handful of soldiers in just a few months. Yet this is what Francisco Pizarro, 168 Spanish Conquistadors and 27 horses achieved in Peru. I read William H. Prescott’s classic history of the conquest of Peru when we travelled there in 2012/13, it reads almost like fiction. The Inca civilisation simply collapsed, doomed because they lacked steel, horses and immune systems capable of surviving European diseases. Prescott makes clear the peril Pizarro’s men found themselves in, and the bravery they displayed, but he also recounts their ruthlessness, painting a picture of vicious killers who would have stopped at nothing. They ruled the former Inca Empire with an iron fist, simultaneously marrying Inca royalty to give themselves legitimacy. Their ambition led to conflict with their fellow Spaniards, and it’s little surprise that three of the four met violent deaths in Peru. Hernando was the only one to die in Spain, in Trujillo, in the Palacio de la Conquista in 1578, but only after he’d spent 20 years in a Spanish prison. I’d wanted to see Trujillo ever since being in Peru and it was a bitter-sweet experience. While I marvelled at the glories of Trujillo, I couldn’t help but reflect on the wonders of the Inca civilisation that were lost, destroyed or melted down. It didn’t seem a fair swap. I didn’t expect it, but there seems little remorse for the town’s role in the destruction of another civilisation. 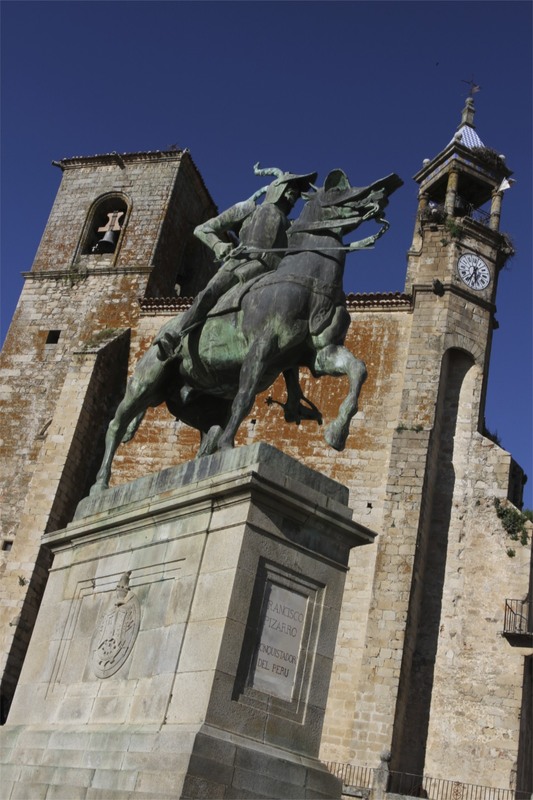 An impression reinforced by the giant statue of Pizarro dominating the main plaza. My guidebook revealed the bizarre story that the statue was made by an American and donated to Trujillo in 1927; but not before he tried to give it to the Mexican Government as a statue of Hernán Cortés. Unsurprisingly, the Mexicans weren’t in the mood to honour the destructor of Mexico’s Aztec and Mayan civilisations. It was ‘renamed’ and given to Trujillo. The Pizarro brothers weren’t the only conquerors of the New World to come from Trujillo. Ñuflo de Chaves was born in a village just outside Trujillo. He founded the Bolivian town of Santa Cruz, a fact I didn’t know when living in Bolivia. 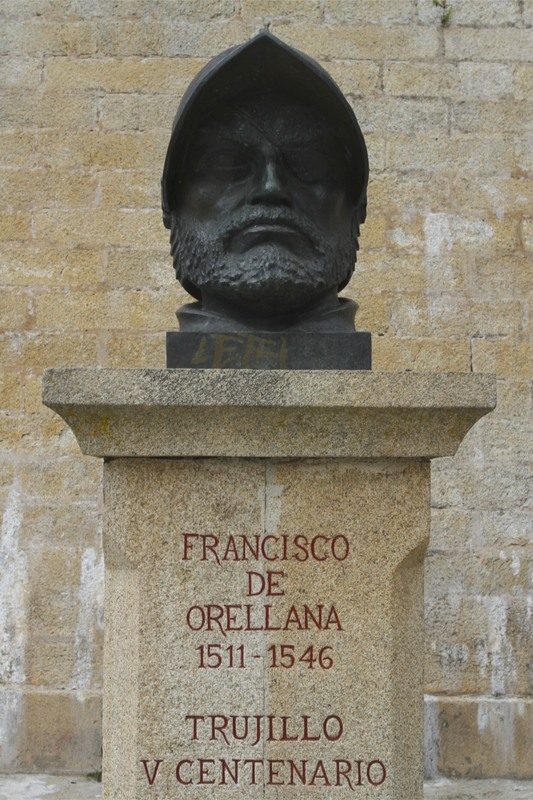 Other Trujillo luminaries include Francisco de Orellana, who accompanied Pizarro in the conquest of Peru, and was the first European to navigate the full length of the Amazon; and Diego García Paredes, known as the ‘Samson of Extremadura’, who founded Trujillo in Venezuela. Their ill-gotten gains are also on display in Trujillo.